Yielding to the popular demand, White House has released beer recipe : Honey Brown Ale, Honey Brown Ale, the Honey Porter and Honey Blonde . White House beer recipe released was named "Ale to the Chief." "With public excitement about White House beer fermenting such a buzz, we decided we better hop right to it. Inspired by home brewers from across the country, last year President Obama bought a home brewing kit for the kitchen. After the few first drafts we landed on some great recipes that came from a local brew shop. We received some tips from a couple of home brewers who work in the White House who helped us amend it and make it our own. To be honest, we were surprised that the beer turned out so well since none of us had brewed beer before. As far as we know the White House Honey Brown Ale is the first alcohol brewed or distilled on the White House grounds. George Washington brewed beer and distilled whiskey at Mount Vernon and Thomas Jefferson made wine but there's no evidence that any beer has been brewed in the White House. (Although we do know there was some drinking during prohibition…) Since our first batch of White House Honey Brown Ale, we've added the Honey Porter and have gone even further to add a Honey Blonde this past summer. Like many home brewers who add secret ingredients to make their beer unique, all of our brews have honey that we tapped from the first ever bee-hive on the South Lawn. The honey gives the beer a rich aroma and a nice finish but it doesn't sweeten it." 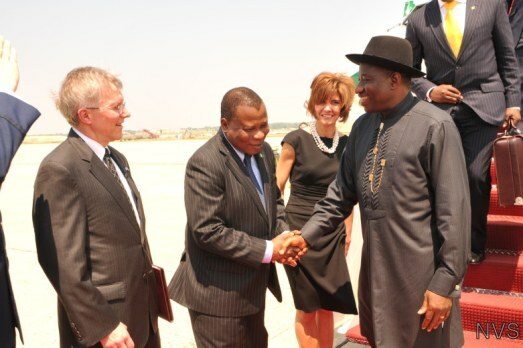 "President Obama and President Goodluck Jonathan of Nigeria met at the White House on Wednesday, June 8 and reaffirmed the strong bilateral partnership between the two countries. The President personally congratulated President Jonathan on the success of Nigeria’s recent elections, which deepened the foundation for future democratic contests. The leaders discussed how the Jonathan administration can build on this momentum by investing in Nigeria’s energy supply, agricultural productivity, democratic institutions, and security sector. The President called on President Jonathan to make fighting corruption a national priority and a critical step in ensuring the necessary conditions for sustained economic growth and lasting prosperity. The President thanked President Jonathan for his leadership both regionally and within the United Nations Security Council on pressing issues such as Sudan, Libya, and Cote d’Ivoire. Both leaders agreed to continue to work together to promote peace and security." 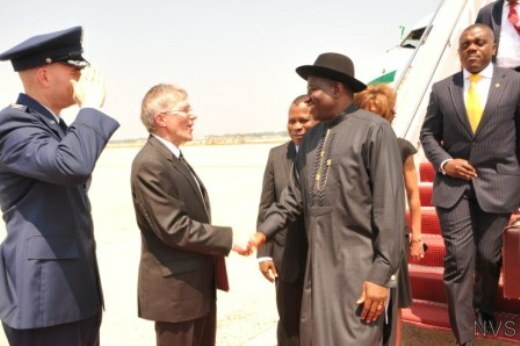 US President Barack Obama will welcome newly sworn in Nigerian President Goodluck Jonathan to the White House on June 8, officials said Saturday. 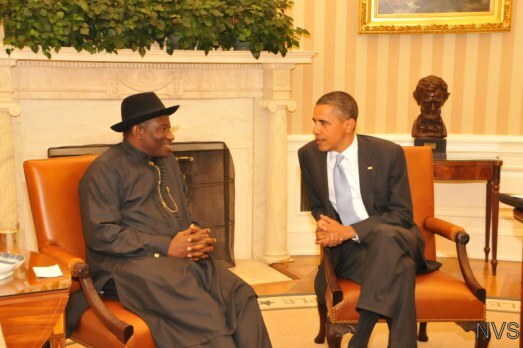 Obama "looks forward to consulting with President Jonathan on the latest regional and global developments, and deepening our strong bilateral partnership," his spokesman said in a statement. Jonathan visits amid renewed tension in his country, after a series of blasts rocked Nigeria following his swearing-in last weekend, killing 18 people. A southern Christian, Jonathan defeated ex-military ruler Muhammadu Buhari, a Muslim from the north, in a April 16 poll that led to an explosion of rioting in Nigeria which killed more than 800 people. In early May Obama commended Nigeria's elections, where he said the majority of ballots were cast free from intimidation, signalling a strong future for democracy, but he slammed the post-poll unrest as "deplorable." 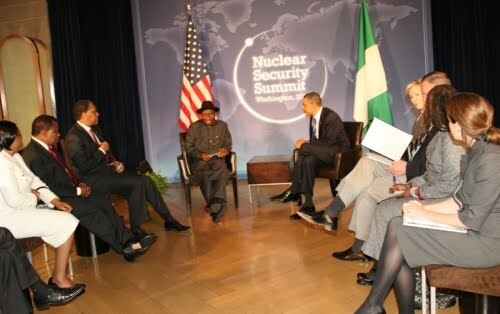 Violence, he said, "has no place in a democratic society, and it is the responsibility of all Nigerians to reject it." Jonathan's visit this week comes a day before Obama welcomes another west African leader, Gabon's Ali Bongo, to the White House to discuss strategic regional and bilateral topics. The administration meanwhile this week announced another initiative to engage Africa with a visit by First Lady Michelle Obama and daughters Malia and Sasha to South Africa and Botswana later in the month. A gift to African countries on her 50 years independence anniversary. One thing that President Obama, singer Whitney Houston and late Rt. Honorable Dr. Nnamdi Azikiwe have in common is the appreciation and admiration of youths. The first President of Nigeria, Dr. Azikiwe in his political campaigns referred to young people as "Future leaders." By this he recognized that tomorrow belongs to the youths and they should be help to realize their God-given potentials and talents. Whitney Houston, the Grammy winner singer, in one of music albums sang, "Children are our future, teach them well and let them lead the way, show them all the beauty they possess." President Obama practical zed it by inviting young African leaders to the White House on the dawn of celebration of 50 years anniversary of independence of 17 African countries. Many observers and editorials in the pages of African newspapers saw it as a snubbed on the current African leaders. These observers and editors were reading the tea leaves upside down. The Obama's administration has a bigger fish to fry than wasting time on calculating on how to make African leaders depressed or make their French wine gathering less festive. Let's make an intelligent guess; Africa is surely not moving forward compare to the rest of the continents and everybody including Stevie Wonder can see it. Therefore most of the problems embedded and occurring in Africa is self infected by the ruling class. The intelligent thing to do is to make sure that ineffectiveness, self-hatred, intellectual laziness and lethargy associated with the current leaders are not passing down to the up and coming generation. African leaders in exception of few have demonstrated that they are not willing to tackle problems confronting their continent. 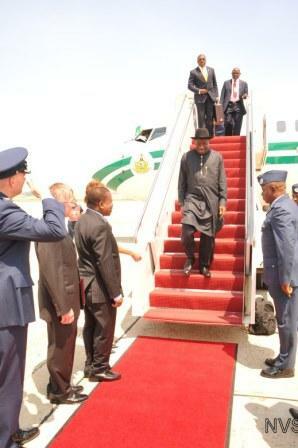 Many of them may talk the good talk but they are not ready 'to roll' and do thing for their people. We have few pragmatic leaders but not the critical mass to make the difference in the continent with regards to the level of poverty, diseases, hopelessness and apathy. New York Times writes, "President convened a forum this week to celebrate the 50th anniversaries of 17 African nations, but he did not invite a single African leader to help him do so. Was this, as the African news media and independent commentators see it, an expression of distaste for abusive rulers? Was it an extension of Mr. Obama's own conviction - already enunciated - that bad government is at the heart of the continent's woes and that "Africa doesn't need strongmen, it needs strong institutions"? " Africa rich in natural resources continue to be the poorest, lest productive and disease-ridden continent. Our African leaders are standing by the side corner, partying and throwing away precious time on unproductive and unsustainable ventures. Apart from few productive African leaders there was no justification for inviting rest of the leaders whose propensity are to overlook their responsibilities. If you cannot teach old dogs new tricks you might as well start with the puppies. In the forum in the White House, "When asked about President Robert Mugabe of Zimbabwe, Mr. Obama told the young people at the forum, "I'll be honest with you - I'm heartbroken when I see what's happened in Zimbabwe. I think Mugabe is an example of a leader who came in as a liberation fighter and - I'm just going to be very blunt - I do not see him serving his people well. And the abuse, the human rights abuses, the violence that's been perpetrated against opposition leaders I think is terrible." President Obama would have added that Africans have the greatest responsibilities of developing their continent. The point of being independent is to demonstrate to yourself and to others that you are free and liberated. Freedom comes with responsibility anything short of that is mockery of freedom.